Agency Power Turbo Fittings - Dezod Motorsports Inc - Home of the automotive performance enthusiast since 2002. AP-UNI-102 is an oil reducing fitting for the GT35R and GT30R turbos. The reducing hole is .046 of an inch. The fitting has a dash 4 male on one end for the oil feed and a 7/16 inch, 24 pitch thread going into the turbo. This fitting is designed to limit the amount of oil going into the turbo to not blow the seals or overload the turbos capacity. AP-UNI-104 is also a dash 10 male fitting. The smaller holes on the flange are a direct fit for the Mitsubishi EVO VIII IX oil pan using stock hardware and gaskets. 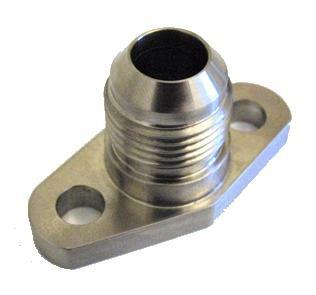 This fitting can be used with almost any turbo kit setup needing a different drain to oil pan hose.